As you can imagine, keeping an aircraft worth hundreds of millions of dollars in tip-top shape is a complex process. Serious teamwork between airmen in several different Air Force Specialty Codes (AFSC) is vital to make it happen. In that group, the tactical aircraft maintainers are commonly known as "crew chiefs" because they're generalists who coordinate the aircraft's care and call in the specialists (like avionics or propulsion technicians) when they find a problem. In other words, if the jet were a patient in a hospital, the crew chief would be his primary doctor, coordinating with specialists in radiology, psychology, and the like as needed. Day-to-day maintenance, including "end-of-runway, postflight, preflight, thru-flight, special inspections and phase inspections." Diagnosing malfunctions and replacing components. Detailed inspection, record-keeping, and administration. Supervision and coordination of aircraft care, as well as such varied duties as "crew chief, repair and reclamation, and . . . crash recovery duties." Like most other technicians, crew chiefs need to have a normal color vision to get the job. They must also pass a background check with eligibility for a secret security clearance. Air Force recruiting literature recommends anyone interested in "aircraft, electronics, computer science, engineering, maintenance, and repair, [or] physics" may find this career engaging. But regardless of their interests, before enlisting, recruits must graduate high school and pass the Armed Services Vocational Aptitude Battery (ASVAB) with a qualifying Air Force mechanical score of 47 or higher. Day one in the Air Force begins, for everyone, with basic training at Lackland Air Force Base Texas. Airmen contracted as crew chiefs stay on in Texas, at least initially, for technical school at Sheppard Air Force Base. It's hard to say how long the rest of a crew chief's initial schooling takes. This official fact sheet 404 from the Air Force claims initial training at Sheppard lasts close to three months, though that probably won't include training on a specific aircraft. See, it's up to the Air Force which aircraft a particular crew chief will train to work on, so if you've got your eye on a favorite, you may be out of luck. After learning basic principles, airmen may be assigned to specialize in maintenance of such craft as F-15 or F-16 fighter jets, the A-10 Thunderbolt, training aircraft, helicopters, the U-2 reconnaissance plane (not the band) or the one that's set to replace most other jets, the F-35 Joint Strike Fighter. Where and how long a crew chief trains depends on which craft the Air Force assigns. Those assigned to work on F-16 fighter jets, for example, move on to Luke Air Force Base in Arizona to finish training. In a 2009 public affairs article, Captain Kimberly Hollenback -- then commander of the training program at Luke -- described an F-16 crew chief's schooling as "four months at Sheppard Air Force Base, Texas, and one month at Luke," where final training consists of a short 20-day program, mostly outside the classroom. Alternately, Airmen destined to work on the (relatively) new F-35 may find themselves concluding training at Eglin Air Force Base in Florida. But, again, course length may vary. CCAF also offers an Airframe and Powerplant Certification Program that helps airmen get FAA certification using on-the-job experience and online courses. 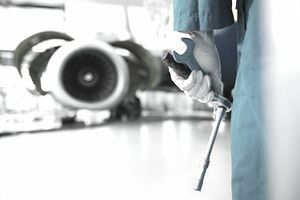 Following a career in the Air Force, crew chiefs may work as aircraft and avionics equipment mechanics or technicians, though the Bureau of Labor and Statistics predicts that field will grow "slower than average" through 2020. This may be one of those fields where, if you enjoy the military, a 20-year hitch to retirement isn't such a bad idea.